Make clean-up a breeze with the Catit Flower Fountain Placemat! The raised edges also keep spilled food and water contained for easy clean up and to prevent dirtying your floors. Soft and flexible placemat designed to catch food and water spills under your pet’s feeding and drinking bowls or water fountains. 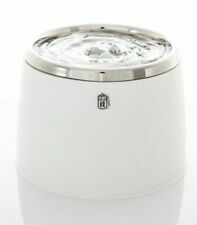 New ListingCatit Fresh & Clear Stainless Steel Top Drinking Fountain, 64 fl. oz. 64 fluid ounce Stainless Steel drinking fountain. Flower Fountains Fountain 3L Cat Water With Triple-Action Filter Pet Supplies. Condition is New Open Box. Free Shipping! We put out what we would like to receive! Thanks!! Ergonomic design matching the Catit Multi Feeder (#43741). Combine the two for a complete dining experience. 3L re-circulating system takes up little floor space. It has been tested/inspected. This set appears to be missing the water softener filter. 9-Pack (3x3pk) Catit Small Drinking Fountain Replacement Filters 50053 & 55600. Condition is New. Catit Fountain Cleaning Set. Two-piece maintenance set for Catt drinking fountains. The set contains a hard bristle brush with fine tip for accessing small areas and a flower-shaped cleaning sponge with dual textures and wavy surface. 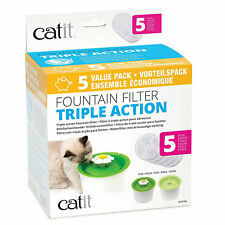 Four Catit water fountain filters, new in shrink wrap. Bought a box of five and used one. The Catit Flower Placemat is the ideal size for Catit Drinking Fountains and feeding dishes (not included). The food grade silicon is anti-slip and easy to clean. The hanging loop on the mat, makes it easy to dry or put away. If the item is used, we will put the condition, and usually, it will have very minor wear. Check out the photos! Pictures are of the actual item you will receive. We hope that's okay with you! Flexibility is our motto! Of course! We are open In the case of an error made by Lucky Pet, we will attempt to rectify this at no extra cost to you. What if I want to adjust or modify my order?. Give your cat a clean and stress-free feeding area with the Catit Flower Fountain Placemat and Stainless Steel Food Bowl Set! For a complete feeding area, this Catit set provides all you need for a hassle-free way to feed your cat and keep the place clean. The Catit Multi Feeder is easy to clean and has an ergonomic design matching the Catit Flower Fountain. Combine the two for a complete dining experience! The Multi Feeder combines storage space with a bowl for wet food and a paw pit for dry food. You are responsible for ensuring that it is correct for your application or purpose. FREE Trial! These are necessary to move things along as quickly as possible. I resolve issues fairly and quickly. 10.7 ounces weight. Large water-to-air surface maximizes oxygenation for fresher, better tasting water. Re-circulating system cools and aerates water. Water capacity: 100 fluid ounce. That being said, if you have a Catit fountain, these filters will fit. The Flower Fountain uses running water to encourage your pet to drink more. catit water fountain. filtered water for kitten. cat water bowl. Best way to encourage your cats to drink more water. Brand new. Only opened once for taking these pictures. 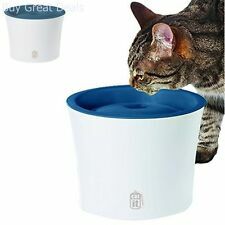 Cat It Safe Pet Re-circulating Flow Drinking Water Filter Fountain w/ Food Bowl. Increased water-to-air surface area adds oxygen for fresher, tastier water. Glass diner, equipped with two bowls. Modern Pet Glass Dishes. The large surface area ensures that the optimum amount of oxygen is added to the water but consuming less than 4 Watts it is also very economical to run. Easy to clean and maintain. BRAND NEW READY TO SHIP.. I SHIP FAST! !